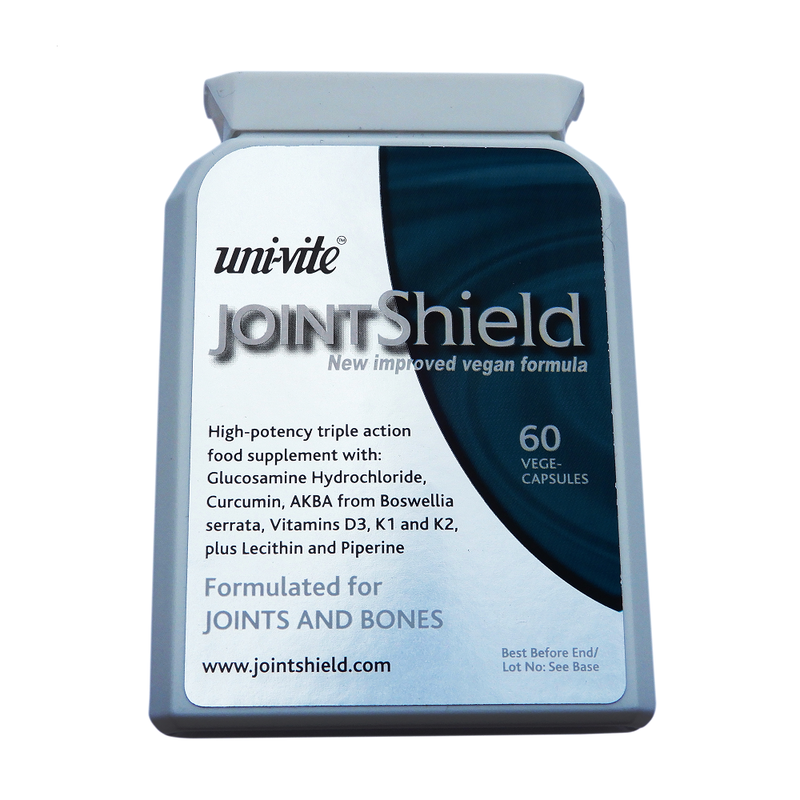 Uni-Vite JointShield is a safe, natural, triple-action formula to bring you short-term relief and long-term improvement in the flexibility, suppleness and mobility of all your joints. Analgesics offer only short-term pain relief. Uni-Vite JointShield is formulated with the express intention of helping the process of long-term improvements in the basic structure and function of cartilage, and the joints as a whole. Curcumin has powerful anti-inflammatory properties that help address the root cause of the discomfort and starts to bring relief. Lecithin and piperine have been added to increase the bio-availability of curcumin. Boswellia has been used for centuries, as it inhibits a pro-inflammatory enzyme called 5-lipoxygenase. People have found it can bring relief from swelling and stiffness in as little as 7 days. Glucosamine is a vital component of cartilage, but needs to be combined with vitamins K (ideally K1 and K2) and D in order to support cartilage regeneration. We use vegetarian-source glucosamine hydrochloride. Extra vitamin D helps calcium absorption for stronger bones. Unlike drugs, Uni-Vite JointShield supports the process of long-term improvement in the basic structure and function of cartilage, and the joints as a whole. Unlike drugs, the only side-effect of the nutrients in this supplement is better health generally. The differences between glucosamine and chondroitin are very minor. Both are naturally occurring substances in bone cartilage and both help slow the destruction of joint cartilage and improve mobility. Glucosamine – providing it is in the presence of vitamins D and K – is enough. MSM or Methylsulfonylmethane is an organic sulphur that is sometimes prescribed for rheumatoid arthritis. Its main function is as an anti-inflammatory – but the curcumin and the other anti-inflammatories in JointShield are more effective. NutriShield Premium or Essentials are Uni-Vite Healthcare’s comprehensive daily supplements which contain Omega 3 among many other essential vitamins, minerals and nutrients.